Our beach house, named Muriel's Grove, is in a highly preferred location that is absolutely wonderful for a vacation and IS THE CLOSEST RENTAL HOUSE TO THE BEACH IN THE GROVE BY THE SEA. It has all the beauty and amenities of Seaside but at considerable $$ savings. The beaches in this area, 'America's Most Beautiful,' are fabulous! Bordered by high sand dunes, the beach is wide with sugar white sand, and the warm water is emerald green. Muriel's Grove is the closest rental house to the beach in the Grove by the Sea (just (200 yards/3 to5 minute walk) and right next door to a large, beautiful swimming pool. It is in the very popular 'Grove by the Sea' community, a quiet and relaxing neighborhood of lovely seaside cottages nestled in a grove of magnolias and pine trees, that includes tennis, a children's play area, two swimming pools, and walking/biking paths. Decorated in light, bright colors with a beach cottage theme, the house is beautifully furnished. There are hardwood floors throughout, and all the rooms have French doors that open to decks and the tropical paradise outside. Plantation shutters on the windows provide a wonderful sense of southern charm. Muriel's Grove is a special house that you will simply fall in love with. The modern kitchen is fully equipped, and the dining area has seating for 11. On the first floor, there is one bedroom (two twin beds) and a queen sized sleeper sofa in the living room. Upstairs are two bedrooms (king bed, queen bed), and a studio room (full sized futon) that can be used as an extra bedroom if needed. Safe, off road trails and sidewalks (perfect for walking, jogging, rollerblading, and biking) provide easy access to the many wonderful nearby recreational areas. Grayton Beach (4 miles), Grayton Beach State Park (2.5 miles), Point Washington State Forest (1.5 miles), Deer Lake State Park (3.5 miles) and Camp Creek Golf Club (5 miles) are just minutes away. The architecturally famous town of Seaside is just 0.9 mile away; you'll love its many colorful homes, small shops, and restaurants. Throughout the year, you can enjoy the many scheduled free events that Seaside has to offer. Early risers can enjoy spectacular sunrises and the wide open space at the beach. Better yet, change the routine - sleep in, open the French doors, and listen to the birds outside. After a late breakfast, build sandcastles, swim and play with the kids, or take a walk on the beach down to Seaside. Enjoy lunch outside on the picnic table in the woods, or take a nap in our hammock and chairs beneath the pines and magnolia next to the pool. You won't want to miss the fabulous sunsets either! In the evenings you can grill fresh seafood outside on the gas grill or just cook spaghetti for the kids. Enjoy dinner with your entire group seated at our large dining table as you share the day's activities with each other. After dinner walk or bike to Seaside and treat everyone to ice cream...or take a dip in the pool, and then relax on the wraparound decks under the ceiling fans as you listen to the sounds of the surf and woods. Later yet, go to the beach, lie on your back, and look at the stars. WOW!--it doesn't get any better!!! Bikes are not included with Muriel's Grove rentals weeks. We will send you bike rental info upon request. NOTE: 3 night rentals available except in Summer and Spring Break. Rental deposits will be refunded only if the home re-rents with no lost time or revenue. There is a $100 cancellation fee taken from any refunded deposits. Refunds will not be given for late arrivals or early departures. Jim and I both retired to the Grove by the Sea in the fall of 2003. Our permanent residence is just 50 yards away from Muriel's Grove, so we are available in a moment's notice should any problems occur during the rental season. We vacationed in this area for many of the years that we lived in Birmingham. Thinking that our kids, who are beach lovers, would always find a way to come visit us here at the beach. we planned to retire to Muriel's Grove. Instead we built our permanent home in the same neighborhood so that we could continue to share Muriel's Grove with families who love the beach as much as we do. We love going to Seaside's Modica Market in for coffee and a muffin during our morning walks. You can park your car and ride bikes to just about anywhere on 30A. Our personal favorite is sitting on the porch with our morning coffee while listening to the birds in one of the most peaceful settings along 30A.. Laundry soap and fabric softener are provided for the convenience of our guests. Liquid dish soap and soap for the dishwasher are provided. Napkins, 1 roll paper towels, a week's supply of trash-bags and a variety of spices are provided. 1 full roll of toilet paper in each bathroom. Seating for 3 more at counter. A variety of family games and jigsaw puzzles are available. Our neighborhood has one tennis court. There also lines for pickle ball on the court. We have 2 community swimming pools in our neighborhood. We had a great stay in this lovely home. House was right next to the pool which was nice and a close walk to the beach. Also less than a mile from Seaside which my teens appreciated. Close enough to the action but in a quiet neighborhood. Everything was clean and the house is well stocked. I liked all the porches which came in handy when it rained. Owners were very nice and helpful. Would highly recommend this place. Great place for families! Great location! Muriel's Grove is clean and well-maintained with plenty of space for our family of 5 (and more). The owners are very friendly and attentive but not intrusive in any way. The location is super convenient: easy walk to beach, shops and restaurants, close to community pool yet very private. Surrounded on 3 sides by native plants and trees. Walking distance to Seaside. My kids give it the ultimate seal of approval by insisting we come back next year! The home itself is well-appointed, very clean and comfy. We enjoyed the grill and picnic table and especially the 2-story decks. Appliances are modern and absolutely everything in good working condition. The community is safe and quiet - we loved our beach vacation! We are so glad you enjoyed your week at Muiel's Grove and hope to see you and your kids again for your next week at the beach. Thanks for taking such good care or our home.. This home is a short bike ride or walk away from Seaside where you'll find plenty of quaint shops to explore and restaurants. Love the food trucks...especially Frost Bites and Meltdown on 30A. Be sure to catch a band playing in the amphitheater or a movie on the lawn. Grove by the Sea is a great neighborhood...sidewalk lined streets, playground, tennis courts and two pools. The pool is located on the lot beside the house and was mostly a private pool during our stay. The home is well appointed and just feels like home with plenty of books and games for those rainy days. It's nicely furnished but not to the extent that you'll feel like you need to remove items that small children could break. Beds were very comfortable. Private beach access is just across 30A and was never crowded. The beach chair set-up was a great bonus that we loved. The access does have several flights of stairs which might be harder to manage with small children and their bear gear. We thoroughly enjoyed our stay and would definitely consider renting this home next time. Owners were wonderful to work with! We absolutely loved our week at Muriel's Grove and hope to return again in the future. The walk to the beach was a non-issue and we loved having the wagon to cart all of the kids' beach toys. We rented bikes and enjoyed riding them down the path to the Seaside town square area for food trucks, ice cream, etc. The area felt very safe and family friendly without some of the "touristy, hustle and bustle". We found the area very relaxing but not boring. Having the house right next to the public pool with our own little path really made it feel private and super convenient. Debbie could not have been more friendly. We loved that we got to meet her out one day as we really never had a need to call her for anything, everything was perfect. We rent houses often and this one had it all - plenty of towels, lots of space and the convenience of a washer/dryer. We are so glad you and your friends had a great girls week end--we hope to see you back next year, or even sooner. Area: Our beach house is in a section of the Northwest Florida Panhandle and Gulf of Mexico referred to as the Emerald Coast and The Beaches of South Walton. The beaches in this area are rated 'America's most beautiful'. Here you will find beautiful open beaches with sugar white sand, dramatic sand dunes, warm emerald colored water, fabulous sunsets, and a golf and bikers paradise. 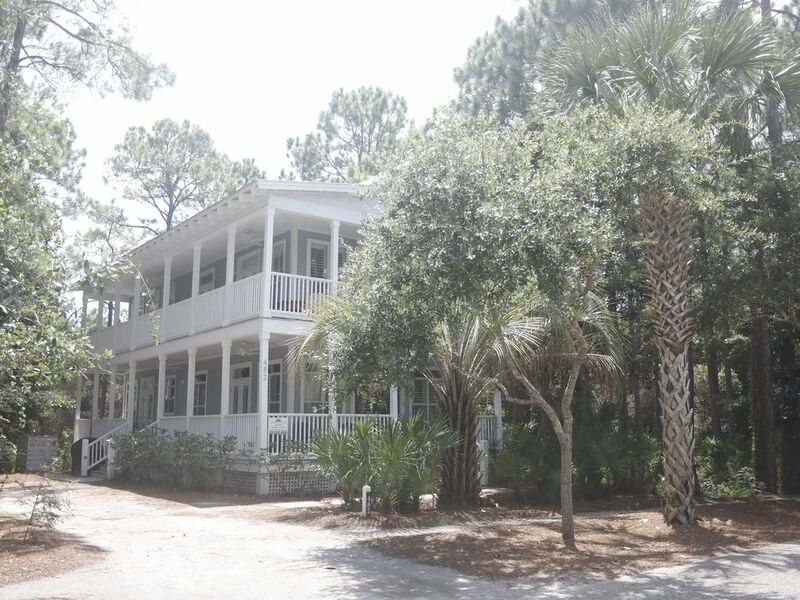 Muriel's Grove is located in the very popular Grove by the Sea community which is 0.9 mile east of downtown Seaside and midway between Destin and Panama City, Florida. Cleaning fees are included in weekly rates. Cleaning fees are NOT included in 3 night minimum rates. A separate $400 refundable damage deposit is required and is due with final payment. An 11% state and local tax will be added to the rental rate. Until confirmed, rates are subject to change without notice.